A town in the far east of Croatia, on the banks of the Danube River, which forms the border with Serbia here. Its darkest chapter in history was during the early stages of the Yugoslav Wars of the 1990s, in what is known locally as the Croatian War of Independence or “Homeland War”. The Battle of Vukovar was the first large-scale military confrontation in Europe since WWII. It was also the beginning of the atrocities and war crimes that came to characterize these conflicts in the Balkans. Today, Vukovar has more memorials and other war-related sites than any other single place in Croatia and it is thus a prime dark-tourism destination. More background info: Vukovar has a long history and passed between different empires numerous times (Croatian, Bulgarian, Ottoman, Habsburg, etc.) before ending up as part of the Kingdom of Yugoslavia after WW1. During WWII Vukovar was part of the NDH (“Independent State of Croatia”), the Nazi puppet state run by the ultra-nationalist Ustashe regime (see under Croatia in general). In Vukovar, the Ustashe massacred some 400-500 civilians – alleged communists, anti-fascists, members of the resistance or sympathizers with the partisans, the majority being Serbs – at a site on the southern edge of town called Dudik (which apparently means 'grove of mulberry trees') between 1941 and 1943. After that, all remaining prisoners of the Ustashe in Vukovar were transferred to the concentration camp of Jasenovac. Vukovar was liberated in mid-April 1945 by the Yugoslav partisans, with some assistance from the Soviet Red Army. The town's civilian German population – once a sizeable proportion (over 25%) due to earlier immigration – was then forcibly expelled and their properties given to Croats and Serbs as communist Yugoslavia was formed. Soon after the war the mass graves at Dudik were discovered and the bodies reburied respectfully. In 1978 a monument commemorating the Dudik atrocities was specially commissioned from the acclaimed architect and memorial designer Bogdan Bogdanović (who also created the famous Stone Flower of Jasenovac). It was unveiled in 1980 (see below). Vukovar meanwhile had made significant steps forward in economic terms, becoming an important trade port on the Danube (which gave it direct connections to Belgrade downriver and e.g. Budapest upriver), of which the huge grain silos are testament. It also became an industrial centre, especially in the manufacture of shoes in the vast Borovo factory (formerly producing shoes for the Bata brand). And then came 1991 and war returned. At the beginning of the break-up of Yugoslavia and with Croatia declaring its independence, tensions were rising high in Vukovar between the ethnic Croat and the ethnic Serb parts of the population. Barricades were erected between ethically different parts of town, and the first escalations of violence occurred. Then the military intervened. The town was under siege by the Yugoslav Army and Serbian paramilitary forces for 87 days, but in the end the under-equipped and outnumbered Croatian defenders lost and Vukovar fell into Serbian hands. By then large parts of the town and the surrounding settlements, industries and infrastructure had been destroyed, prompting even comparisons with Stalingrad. In terms of the death toll, however, Vukovar was on a much smaller scale. Still ca. 2000 fighters were killed on both sides, plus well over a thousand civilians – and over 20,000 former inhabitants, primarily the ethnic Croat population, were displaced and forced into exile. The worst episode of the Battle of Vukovar was the Ovčara massacre, which is therefore commemorated in several locations. I won't go into further details of the battle and those atrocities here – the full military details are outlined at the relevant museums in Vukovar, and you can also find endless material online. I don't want to (nor could I) compete with those. Suffice it to say that Vukovar initially remained in Serb hands immediately after the war but was eventually returned to Croatia in 1997. Only some of the exiled population have returned since, though, so that the population is still only just above half of what it had been before 1991. And many war ruins still remain, just left behind, unused, unneeded. 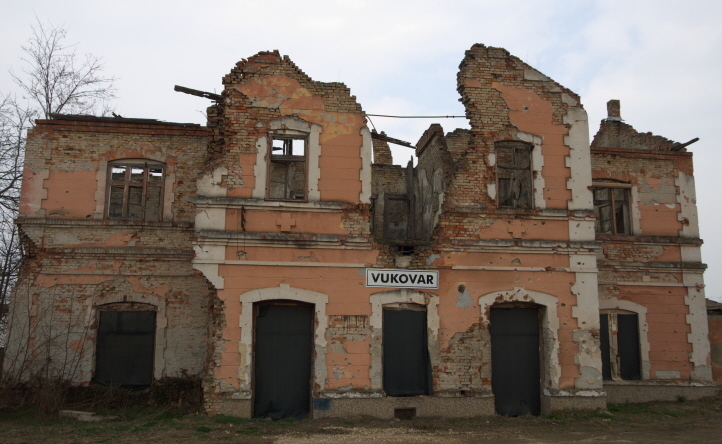 Economically, Vukovar is also still well behind what it was before 1991, and some industrial areas, too, remain in ruins. Of the once vast Borovo shoe factory, for instance, only a tiny proportion is in operation these days, the rest lies derelict and abandoned. Of the once 24,000 employees, only under a thousand remain. Overall, unemployment in Vukovar is very high, at about 40% according to some sources. As in parts of Bosnia & Herzegovina you get the impression that there's merely a lid on the tensions and that lifting that lid could result in renewed conflict. But let's hope that when that happens, it can be resolved in a more peaceful manner than in those tragic years in the 1990s. What there is to see: A lot! Far more than you would think for such a remote and comparatively small place. But history has left its marks here aplenty. In particular the Battle of Vukovar and the atrocities that came with it are commemorated in about a dozen places alone. And then there are the many war ruins, and a peculiar Yugoslav-era monument, plus a brand new cultural museum that offers unexpected dark elements too. In addition there's plenty more. This includes first and foremost, the primary landmark of Vukovar since the war: the damaged water tower, riddled with scars from endless shelling. This landmark features a lot in souvenir shops, where you can buy scale model copies in various sizes, as well as on books and postcards. And I even spotted a tourist-info-screen column in the town centre whose outer shape recalls that of the iconic water tower. The actual tower, however, was covered in scaffolding when I visited Vukovar in March 2018. Apparently it is undergoing a massive renovation project that will turn it into a properly commodified tourist attraction. Until now it just stood there in its ruined state, and apart from a few adventurous urbexers nobody ever went inside and up to the top. Going by the illustrations on the fence by the base of the tower, it is envisioned that not only the structural integrity of the tower will be secured, but there will also be a lift and an observation platform at the top, possibly even a café/restaurant. I'm not sure if such a heavy-handed facelift is preferable to allowing the war ruin to stand in its original, damaged state, but I guess it's still better than letting it crumble away. Apart from this most iconic war ruin, Vukovar also has plenty of smaller ones, e.g. the many residential houses that were never reclaimed after the war and remain damaged and derelict. 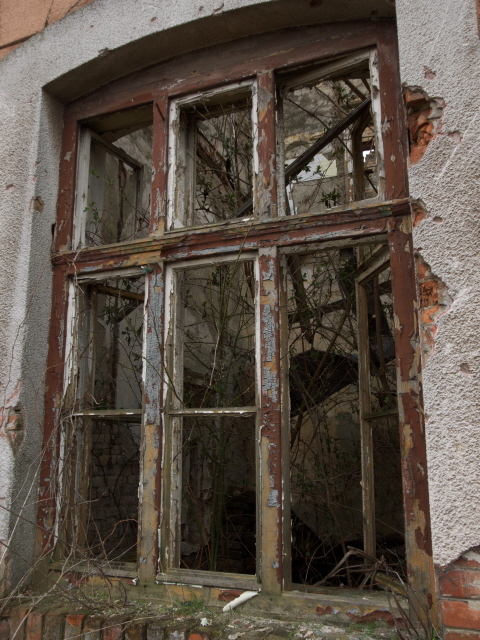 But there are also bigger abandoned and ruined structures. 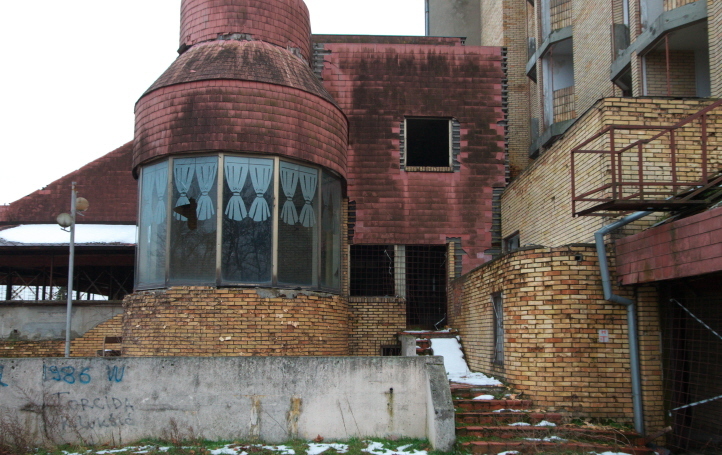 In the centre of town, between the mostly restored Old Town and the river, is a large abandoned hotel building that just stands there empty and boarded up. This used to be the Hotel “Dunav” ('Danube'), with I would guess a ca. 50-room capacity, spread over seven floors. You can't go in (without breaking in and ignoring the signs), but it's quite a sight to behold from the outside. So is the former train station building near the harbour, that is a badly battered ruin – though a very atmospheric one for those (like me) who appreciate beauty in decay aesthetics. The old station even received a new sign above the door in the centre, which looks incongruously clean and intact. Just behind the old station is the harbour with its cranes – which were shifting scrap metal when I was there – as well as the tiny and bland new train station. Right next to this is a huge concrete structure, basically just a concrete roof atop two rows of columns but nothing inside. Maybe this was once to be the new station, but downgraded to the small one next door, probably due to lower volumes of traffic these days. I never saw any passenger trains here – only one freight train waiting to be loaded (possibly with scrap metal from the harbour?). There are also less dramatic or obvious war-related sites. For instance, there is a memorial stone on the south-western edge of the town that marks a mass grave from the war at the bottom end of Nova Street. Totally inconspicuous are the Velepromet hangars just south of the Homeland War Memorial Centre. But during the war these were apparently used as a prison camp. On special occasions, so I was told at the Ovčara Memorial Centre, the hangars house temporary exhibitions about those days. But when I was there they were in ordinary use as garages and for storage. Also on the southern edge of town is the Dudik monument (Spomen-park Dudik) that commemorates Ustahse massacres during WWII (see above). This strange design by Bogdan Bogdanović (cf. Jasenovac) consists of five big cones made of stone with copper tips at the top. In addition there are a few plaques and a set of “boat stones”. You can find out about all the symbolism and design details (and precise directions) on spomenikdatabase(dot)org/vukovar. The monument was badly damaged in the Battle of Vukovar and for many years was in a sorry state, but since 2016 it's been restored to (almost) its former glory. The copper tips have been renewed and the field around the cones cleared of undergrowth. You can still see some scars on the cones' stone bodies and bullet holes on the “boat stones”, but overall it's been adequately restored. I even saw a fresh wreath on the central memorial stone that had clearly been laid down not long before I was there. In contrast to the Dudik monument Vukovar's former synagogue remains unrestored. It was once a grand affair, built (in 1889) for the once significant Jewish community of Vukovar that was mainly made up of settlers from across the Habsburg Empire who had come to these parts during the 19th century. In 1941, when the Nazis took over, the synagogue was plundered and badly damaged, and the Jews killed in the Holocaust. 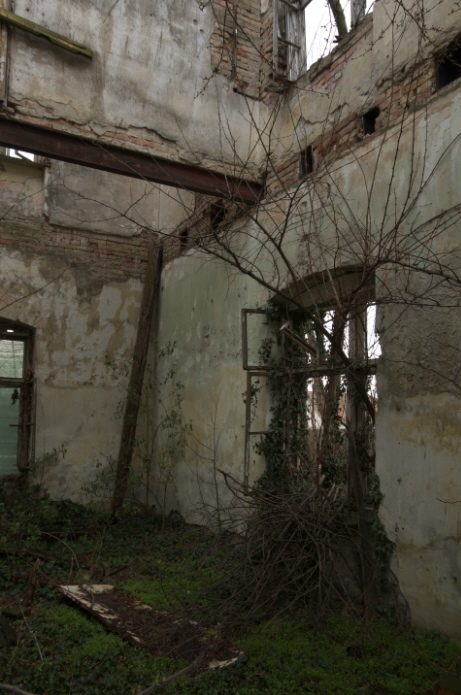 What remained of the synagogue suffered further destruction in the 1950s in the Yugoslav era. 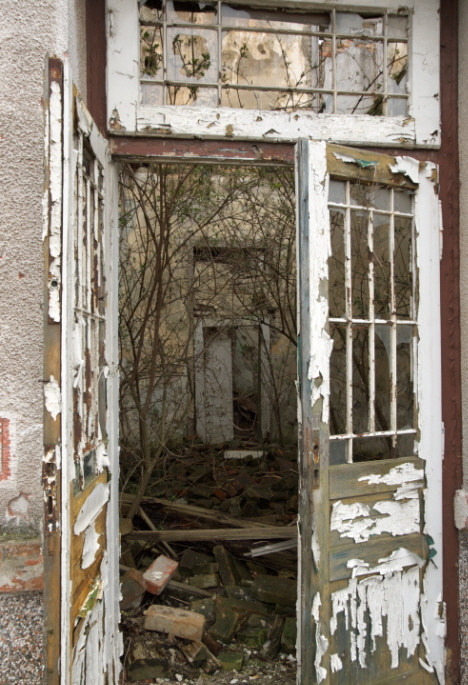 Today, only the gate and parts of a back building (abandoned and empty) survive. But at least the roof of the building seems to have been restored at some point (it looks decidedly newer than the rest of the edifice). And it is crowned by a Star of David. Another star can be found as part of the metal gate. Silent signs of a bygone era. Placed against the front wall of the building I saw a withered wreath, obviously put here a long time ago. Seen from inside the Memorial Centre of the Homeland War, just beyond the main gate, you can still see bullet holes along the side wall of the synagogue building. Yet more memorials can be found in the town centre. This is either side of the Vuka River where it flows into the Danube. To the south is the Old Town, to the north a newer cluster of buildings, including a shopping centre and a modern hotel. To the west is a marina and on the end of the dam on its southern edge stands a large memorial cross – dedicated to the victims of the Croatian War of Independence. Its base bears an inscription in an old Croatian alphabet, saying (according to the local tourist information): “The one who dies honestly will live forever” (don't ask for logic). There's a footbridge south of the marina across the Vuka that has some wild “3D”-effect graffiti and that takes you to the square north of the Old Town. Here you find the obligatory bust of post-Yugoslav Croatia's first president Franjo Tudjman (monuments to him have sprung up all over the country in recent years). Just beyond is the old water tower in front of the abandoned “Danube Hotel” (see above). Behind the hotel is a strange monument that resembles a string of falling domino stones. But I don't know anything about this monument's significance and meaning. Even in the mostly restored Old Town (it was in total ruins after the Battle of Vukovar) there are still some war ruins to be spotted. The rest of Vukovar cannot really be called particularly pretty. There are typical socialism-era apartment blocks, but mostly its detached or semi-detached two-storey family houses that dominate the townscape. It's not exactly a lively place either. But the people I met at the pension I stayed at, the restaurants I ate in and the museums I visited were all quite friendly and welcoming. So I quite enjoyed my four days in Vukovar. And the almost overwhelming plethora of dark-tourism sites made it a very worthwhile trip anyway. Location: on the edge of the Slavonia region in the far east of Croatia, ca. 150 miles (250 km) from Zagreb, on the banks of the Danube River, which forms the border to Serbia here (Belgrade is only 80 miles/130km away to the south-east). Access and costs: a bit remote and way off the usual tourist track, but easy enough to reach by road; quite inexpensive. Details: it is easiest to get to Vukovar by car; in theory the town can also be reached by train, but it's a long and convoluted route. And once in Vukovar you'll need your own means of transport anyway to travel between the various individual sites, so I recommend getting a hire car in Zagreb (unless you're using your own car to get to Croatia anyway, of course). It's a fairly easy drive mostly along the fast A3/E70 motorway. This is a toll road and in total I think I paid something like 150 HRK (ca. 20 EUR) for the distance from Zagreb. The drive takes about three hours. You have to leave the motorway at exit 19 (Županja) and take the 55 road, passing through Vinkovci en route, but otherwise this road is also relatively fast. For getting around in Vukovar and environs you'll also need a car (locally a bicycle could do for that – but you'd have to get it there first, or find a place to hire one from) as the various individual sites are beyond walking distance from each other. For accommodation there's a small but decent range of options, including very affordable pensions (even with private parking). I paid less for three nights in Vukovar (at the very friendly Pansion Villa Vanda) than I did for a single night in Zagreb. A more upmarket option is the Hotel Lav in the modern part of the town centre north of the Vuka River (pricier but still more affordable than the average room rates in the capital). Food & drink are quite affordable too in Vukovar, although the range of options for eating out is a bit limited. Beyond typical Croatian and local Slavonian fare (river fish features a lot in the latter) there are only a couple of pizzerias and one basic Mexican place. Time required: at least two full days to see all that's covered in the above, plus a bit of time for some of the non-dark things, and of course time for getting there (ca. 3 hours by car from Zagreb). Combinations with other dark destinations: See under Croatia – the closest other dark site listed here would be Jasenovac, which is a ca. 125 miles (200 km) drive away to the west. And Zagreb isn't that much farther. Combinations with non-dark destinations: This corner of Croatia is really quite off the beaten tourist track, though it's not without is charms. In Vukovar itself there isn't much of traditional tourism interest except the very compact reconstructed Old Town with its pretty baroque colonnades and the recently restored former Grand Hotel, a couple of churches and the Castle Eltz (more a manor house than a castle), which also houses the Vukovar regional museum. Outside Vukovar, a place worth getting to is Ilok, in the far-eastern-most corner of Slavonia, which almost forms an enclave within Serbia here. Ilok has a pretty mediaeval Old Town and is one of the centres of wine-making in eastern Croatia, with an old cellar and wine tavern in the centre giving quaint evidence of this. The views across the Danube (and Serbia beyond) from the high loess bluff that Ilok sits on are quite picturesque too. The town is a good 20 miles (35 km) to the east of Vukovar at the end of the No. 2 road. The drive there (ca. 30-40 minutes) is also quite scenic in parts. For more see under Croatia in general.